Longwood Tower Quarry, a series of gritstone quarries and a bit of natural rock. Easy enough to find as it's right next to, and dominated by, the very visible Victorian folly - Nab End Tower. Mostly lower grade bouldering problems with a few routes thrown in. Plenty of graffiti. There is a recorded buildering problem on the tower itself - Tower Traverse Font 3 - starting below the handrail, spiralling round the tower and up above the steps to the top. Due to the condition of the tower this is not advisable at the moment. Numerous routes to get here from most areas of Huddersfield. The easiest route is probably from the main roundabout at Paddock, taking Longwood Road which turns into Vicarage Road and then becomes Thornhill Road. Park carefully on the road near the newsagents or the Rose and Crown pub and take the path up behind where the cemetery is to come out near the tower. Click on the camera icon to view images of the problems being climbed or click on the video icon to view videos of the problems being climbed. Hovering your mouse over, or clicking on, the name/grade of the problem will show the problem highlighted on the topo photograph below. 1) Font 3 Hiding behind the gorse bush is the left edge of the wall. 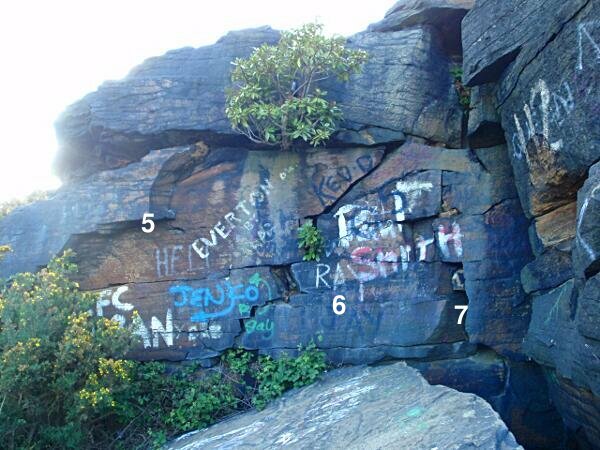 2) Font 4+ Sit start the overhang and crack adjacent to LG graffiti, to the pockets and then upwards. 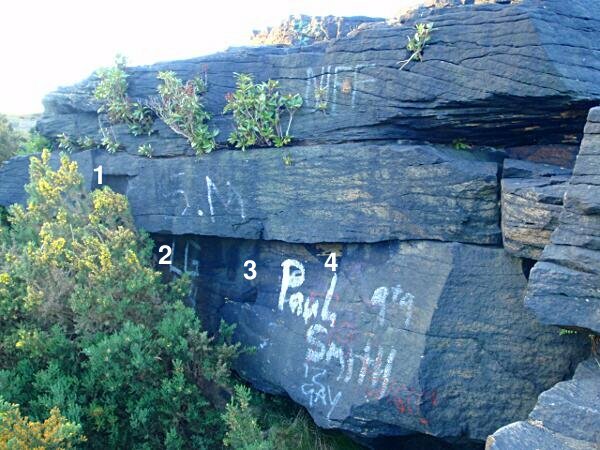 3) Font 5+ Sit start the crack and trianglular pocket just left of Paul Smith graffiti. 4) Font 3 Up the ramp. 5) Font 3 The overhanging left edge of the wall. 6) Font 5+ The centre of the wall with awkward moves at the top. 7) Font 4+ The rightwards angled flake and scoop. Finish to the right and watch the landing. 8) U2 - Font 3 Just around the corner go up the wall, watch the landing. 9) Font 5+ The blank wall just left again. 10) Font 3 Just to the left, the wall with the crack. 11) Font 3 The orange wall, watch the landing. 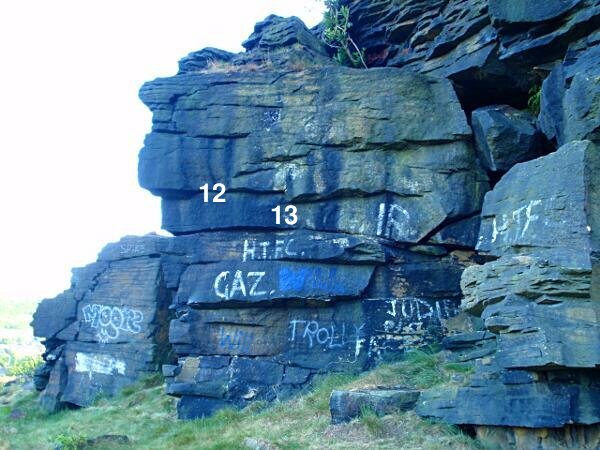 12) Font 3 Up the centre of the wall, the crack is 'in' at this grade. 13) Font 4+ Up the centre of the wall, the crack is not 'in'. 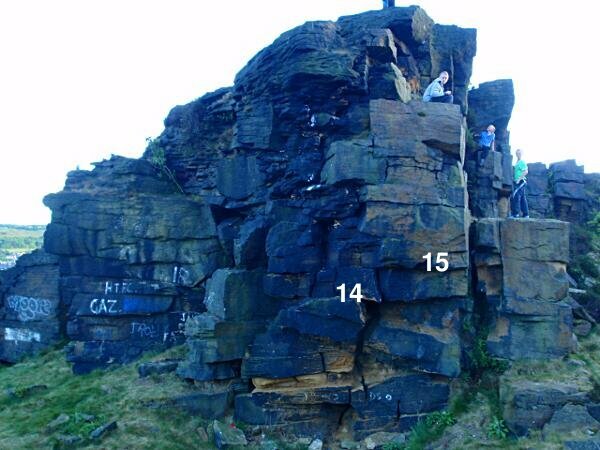 14) Font 5+ To the right of the triangular block, up the wall, but no using the right arete. 15) NATURAL BORN NOSE - HVS 5a The nose on good rock. 16) S 4b The wall to the left of the shabby corner. 17) VS 4c Just left of that hole, the wall. 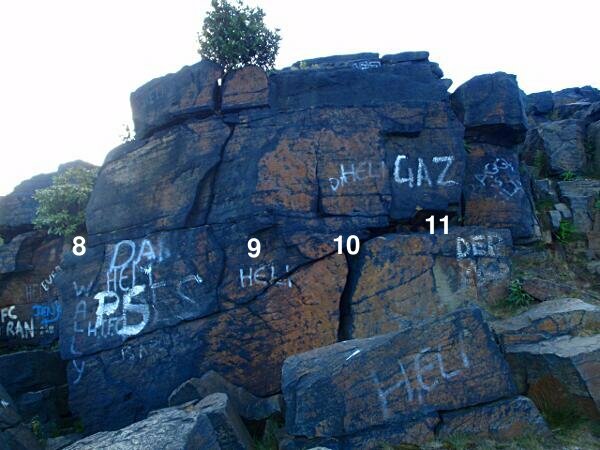 18) HS 4b Cracks and ledges just to the right of the hole. 20) Font 4+ Just to the right crimp out left to the break. 21) BAD BOYZ - HS 4c The cracked wall just left again. 22) VD 3c Dirty crack left of the sandy scoop. 23) Font 3 The bulging sandy wall just right of the scoop. 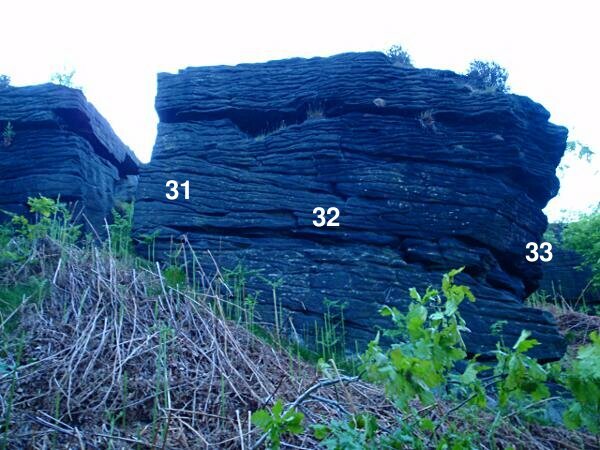 24) LEFT CRACK - HS 4b Follow the crack to the ledge, finish up the left hand crack. 25) HOLE CORNER - VS 4c Up the corner left of the hole to the ledge, then up the small wall to the right. 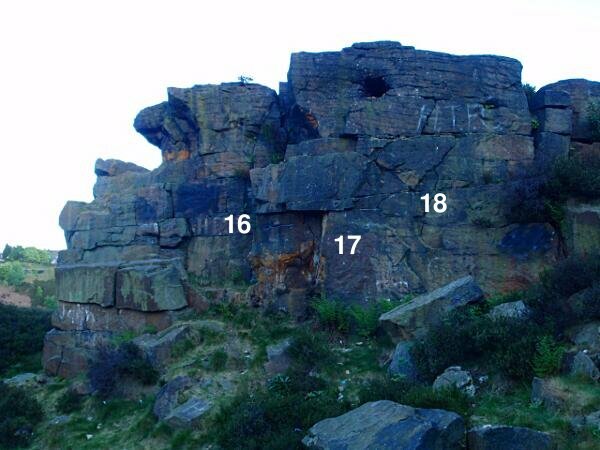 26) Font 3 3m to the left of the arete use the flake to gain the ledge with the hole. 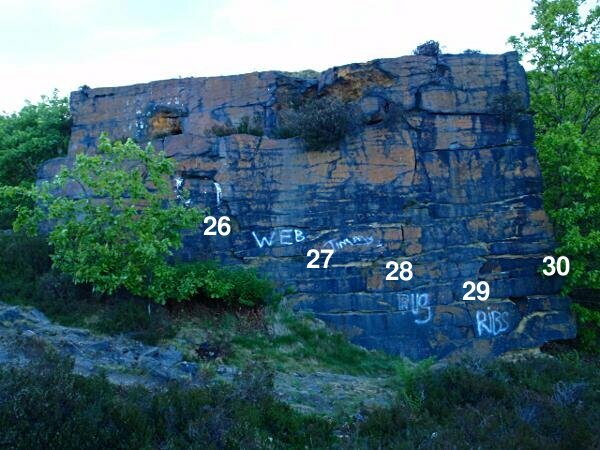 27) Font 4+ 1m to the right of the flake, crimp up the wall. 28) Font 4+ The wall 2m right again, finishing on the right hand end of the ledge. 29) OFF FROM WORK - HVS 5b From the middle of the wall head upwards to the nice cracks. Plenty of good passive protection placements. 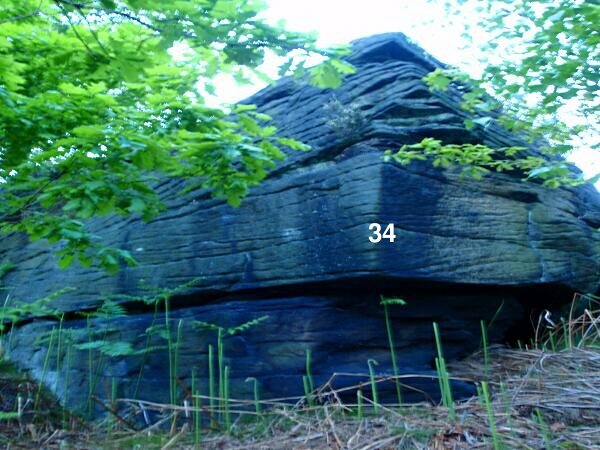 30) GOOD UN - HVS 5b At the end of the wall is a square arete. 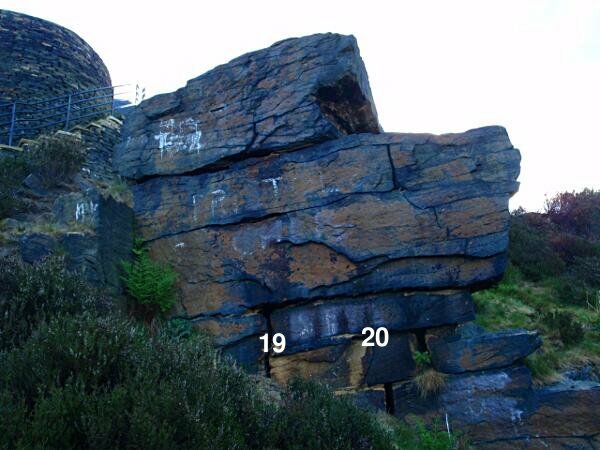 31) Font 3 The left edge of the buttress. 32) Font 3 Up the middle of the black wall. 33) Font 3 Just to the left of the cave head up the arete. 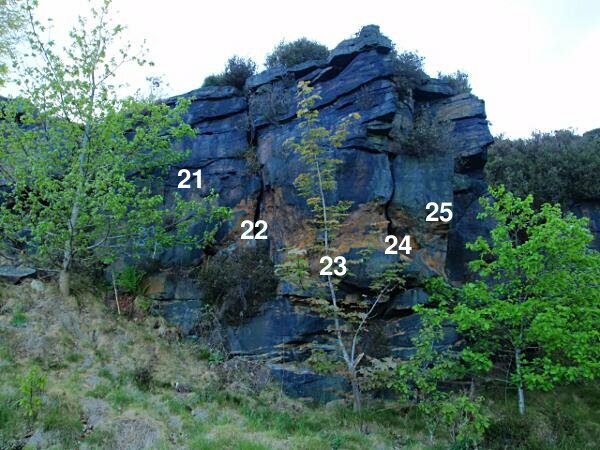 34) Font 3 Up the arete. Thanks to Alex for his photographs and help. Photographs and videos of any problems are more than welcome and can be included on the site.